Toni Morrison is one of the most revered authors of our time. She gives us imaginative stories, and characters that both inspire, delight and horrify us. But is a great writer also, naturally, a great speaker? If you are a fan of Audible, as I am, you know that the two do not necessarily go hand in hand. One of the things that made Morrison’s 2011 Rutgers address notable is that she was paid $30,000 for that appearance– a steep fee for anyone, but especially for a fiction writer. Still, as the New Yorker pointed out in an article written to highlight commencement addresses by writers, her speech was called “stirring, soulful, and at times playful, and measured with outrage and hope—[with] a value that is hard to quantify in financial terms.” In fact, this commencement address is considered among the best in modern times and one would expect the value to be found in the words she chooses on this auspicious occasion. While that is true, there is more to it. There is serious work, truly serious work, for you to do. I know you have been blasted with media designed to change you from citizens to consumers, and most recently, simply tax payers; from a community of engaged civic life, to individuals with hundreds of electronic friends; from a yearning for maturity to a desire for eternal childhood…Every true heroine breaks free from his or her class—upper, middle, and lower—in order to serve a wider world. At first listen, Morrison’s words are poignant and relevant, but her voice is not remarkable. In fact, it is soft and foggy at times, and her pace is slow. Still, we find her voice haunting, distinctive, even if, at times, also monotonous. Surprisingly, she makes an impact with her voice that is equal to the words she uses, and this is the added value of her talk for speakers. Whether possessed with a great voice or not, we can all learn from her by studying her use of three techniques for great delivery; she demonstrates that sometimes the most powerful sound is silence, she aligns her delivery with a deep intention, and she connects her words with meaning. Be comfortable with silence. 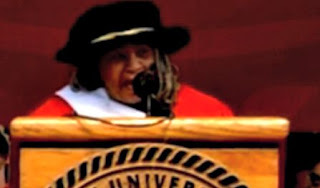 The art of reading aloud is often used in commencement addresses because the speakers want to make sure they get their important statements just right. It is perfect for Morrison, whose words define her in our eyes. Yet how much more are we impacted by a writer, reading her own writing, who pauses once in a while? We listen and hear what isn’t being said, the depth of the words as they apply to our own lives. Pausing allows space for the audience to listen and take it all in. Listen to how she uses silence to create discomfort in the audience and underline her words. I have often wished that Jefferson had not used that phrase, ‘the pursuit of happiness’, as the third right—although I understand in the first draft was ‘life, liberty and the pursuit of property.’ (pause) Of course, I would have been one of those properties one had the right to pursue, so I suppose happiness is an ethical improvement over a life devoted to the acquisition of land; acquisition of resources; acquisition of slaves. Still, (pause) I would rather he had written life, (pause) liberty (very long pause) and the pursuit of meaningfulness (pause) or integrity (pause) or truth. Align your delivery with your intention. Every good talk has a purpose, or an intention, as I prefer to describe it. An intention is “an aim that guides action.” Morrison’s intention is to persuade, inspire, and even enrage the young people enough to convince them to create the stories of their lives with enough imagination to do the serious work of making a better world. Her alignment with this is demonstrated when you listen to her stress words (in italics below) that convince us of the urgency of her point of view. I know that happiness has been the real, if covert, goal of your labors here. I know that it informs your choice of companions, the profession you will enter, but I urge you, please don’t settle for happiness. It’s not good enough. Of course, you deserve it. But if that is all you have in mind—happiness—I want to suggest to you that personal success devoid of meaningfulness, free of a steady commitment to social justice, that’s more than a barren life, it is a trivial one. It's lookin’ good instead of doing good. Connect your words with meaning. The use of inflection or vocal variety is powerful in communication. It connects to the meaning behind what is being said. This is a technique Morrison uses throughout her talk, but listen to how the meaning behind her words pops as she uses several types of vocal variety to talk about what people in the future might think of the state of the world in 2011. We don't have a proper text, but there are quotes in the New Yorker article linked above, and this listener did a transcript on her blog. You can watch the video here, or below. Author of Can You Hear Me Now? 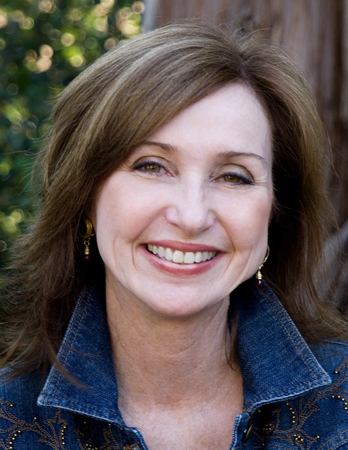 Harnessing the power of your vocal impact in 31 days, Kate Peters has helped prepare and strengthen TEDMED, TED and TEDx speakers to perform with confidence and, as an executive coach, her clients include executives at Fortune 50 companies. Prezi lists her blog, Kate’s Voice, as one of the top Public Speaking Web Resources, globally, and Kate has been voted one of 30 Global Gurus in Communications by globalgurus.net in 2013, 2014 and 2015. Her blog can be found at http://www.KatePeters.com/blog.